Unveiled at Facebook's Innovation Pop-up, which is visiting London's Bedford Square this week, Aquila is a massive, flying wing drone/UAV that will hover, pilotless, above regions currently cut off from the web, beaming down the internet via lasers. No, that doesn't sound very plausible, does it? But Facebook is determined to make it work. Aquila was described in a July Facebook post by Mark Zuckerberg as having "The wingspan of a Boeing 747, but weighing less than a car" - the image below gives an idea of the scale of the thing. Ten per cent of the world's population still has no mobile internet connectivity at all, and much of it has 2G only, and the solar-powered, 3D-printed and carbon fibre- and solar-panel-coated craft is designed to address that. The intention is that thr super-lightweight flying wing will cruise at a height of over 60,000 feet - far above the 30,000-40,000 altitude of most commercial flights, and also 'above the weather' - for up to three months, powered by the sun. The internet connectivity would be transmitted from ground stations via lasers to the ships, which would fly in circles two miles in diameter, relaying the signal to transmitters on the ground, which would then be accessible on mobile devices in the usual way. Among the other issues to be resolved in order to get Aquila flying is that beaming a laser at a moving target 60,000 feet up is what top scientists call "bloody difficult". Another is that there isn't really any regulation in place for aircraft at this height. As a result, this is unlikely to go into service for at least five years. There's also the question of whether private companies should be providing this kind of infrastructure rather than states and NGOs. 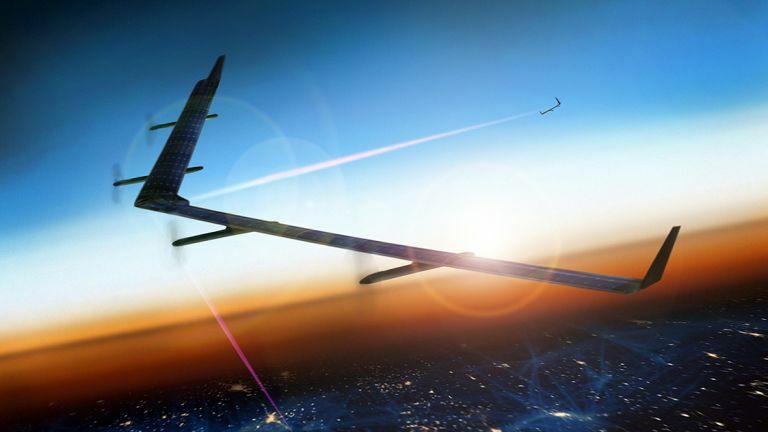 But then again, while Facebook and Google (with Project Loon) try to make developing-world web connectivity work, happen nobody else is stepping up to the plate. Aquila is the most sci-fi incarnation of facebook's Internet.org, which already uses a number of means to bring the web - and, by extension, Facebook.com - to remote and poverty-stricken areas of the globe. Also at the Innovation Pop-up, Facebook showed off Oculus Rift, set pulses racing with the current state of the art in its data centres and, perhaps most impressively, an AI camera that could not only recognise what breed a dog is, just by looking at a photo of it, but has also learned what Nutella is. Read Mark Zuckerberg's post about Aquila here.